"I think maybe we will have some luck and catch the Lumpa-Rupper today. It always makes a mess of my hard work." 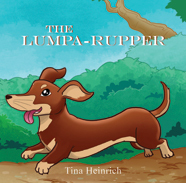 One day, her owner asks Fee-Fee to help her get rid of the housewife’s enemy, called the Lumpa-Rupper. Fee-Fee yips with happiness at this task. The couch and bed are in disarray with the covers bunched up, a sure sign that the Lumpa-Rupper has been around. So, Fee-Fee’s owner goes to work, making first the couch and then the bed nice, even, and smooth. But when she goes back to the same rooms to vacuum the rugs, she sees that the Lumpa-Rupper is up to its usual tricks: the couch and bed are rumpled again. “We never saw it but we knew it had been there.” Why didn’t Fee-Fee see the Lumpa-Rupper and give a warning bark? Heinrich, a retired professor, calls writing her “secret passion.” It’s clear from this neatly constructed work that she intends pursuing that passion by writing for children. This book has been well-thought-out. It humorously reveals tendencies of dogs that most youngsters will surely recognize: dogs are usually enthusiastic about activities that have some pay-off for them, are obedient when it suits their purpose, and are generally so endearingly cute that you forgive their small faults. The book’s artwork also contributes warmth and happiness to the story. Fee-Fee is animated, avid, excitable, and, we learn, upset by loud noises—not the first pooch to hide in the bed under the covers when a vacuum cleaner is turned on. The expressive drawings make all these traits believable. The author has set herself the task of slowly building a mystery that children will gradually grasp and enjoy. The reader of the book, whether a grandparent, parent or an older child, will be treated to the young listener making guesses as to what a “Lumpa-Rupper” might be, based on the storyline and the well-paced illustrations. Heinrich finishes her story with a set of questions designed to test the child’s reading or listening ability, identify the Lumpa-Rupper, and give some reasons why Fee-Fee acts so strangely when she’s supposed to be helping her owner find and get rid of the mysterious creature that’s messing up the house. Definitely targeted to pre-school children, with some gentle detective work required as the story develops, this is a book that a family can appreciate together. It is just long enough to build excitement and short enough to make a good bedtime read.